1.2.2 How to download the BSSC Inter Level Admit Card 2018? 1.3.1 1. In order to download their Admit Card candidates have to go to the links provided below. 1.3.2 2. After getting the link candidates need to click on it for downloading their Admit Card. 1.3.3 3. Candidates have to enter their name, DOB and have to click on the “Login” tab. 4. After providing their details appropriately & clicking the “Login” tab candidates will be able to download their Admit Card. 1.3.4 5. Candiadtes can also download their Admit card from the official site of the BSSC. Hello Guys, पीछे के कुछ पोस्ट की मदद से आप सभी को अवगत कराता रहा कि बिहार एसएससी की परीक्षा कब होगी अब आज के इस पोस्ट में आप सभी को बता रहा हूँ वो लेटेस्ट न्यूज़ जिसके द्वारा आप Bihar SSC Inter Level एडमिट कार्ड डाउनलोड कर सकते हैं काफी आसानी से. इसकी एग्जाम डेट की ज्यादा जानकारी आप निचे के इस विडियो से भी ले सकते हैं जिसमे इसके एग्जाम डेट के बारे में विस्तार से बताया गया है…. How to download the BSSC Inter Level Admit Card 2018? 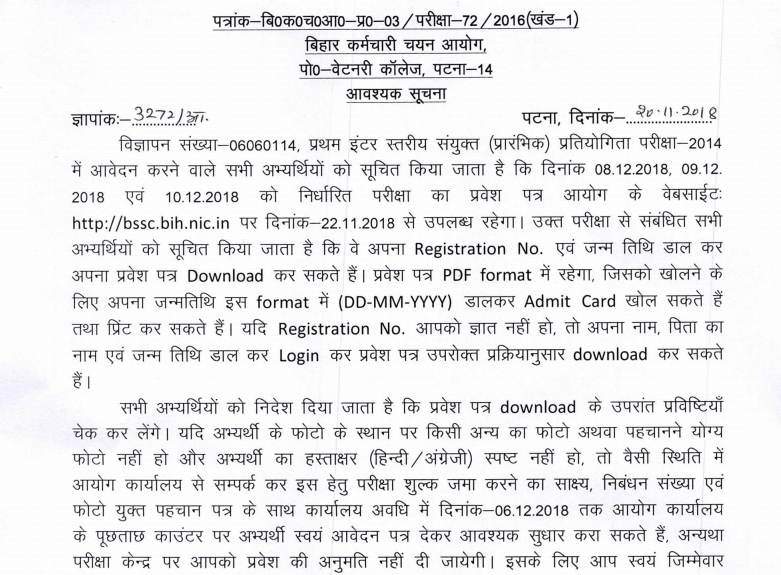 Candidates who are going to take the written examination of BSSC Inter Level then you must download your admit card on or before the examination date. 1. In order to download their Admit Card candidates have to go to the links provided below. 3. Candidates have to enter their name, DOB and have to click on the “Login” tab. 4. After providing their details appropriately & clicking the “Login” tab candidates will be able to download their Admit Card. 5. Candiadtes can also download their Admit card from the official site of the BSSC. खबर ये भी है कि अब BSSC की परीक्षा ऑनलाइन होगी ऐसे में सभी अभ्यर्थी के लिए काफी सहूलियत होगी. बिहार कर्मचारी चयन आयोग (बीएसएससी) से नौकरी की आस लगाए युवाओं के ये लिए राहत की खबर है. 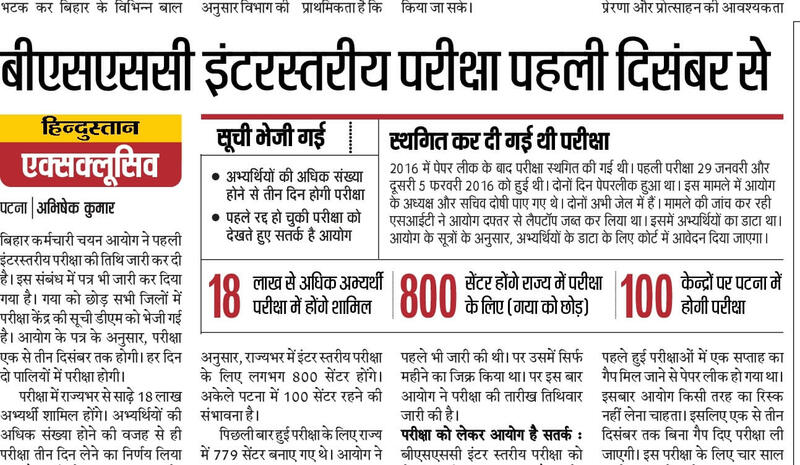 आपको ये भी बता दें कि कंप्यूटर बेस्ड परीक्षा लेनेवाला बीएसएससी पहला आयोग होगा. अभी राज्य में कोई भी चयन आयोग कंप्यूटर आधारित परीक्षा नहीं लेता है. यदि आप इसका एडमिट कार्ड डाउनलोड कर लेते हैं और आप एग्जाम सेण्टर पर जाते हैं तो आपके पास प्रूफ में इनमे से एक का होना बहुत जरुरी है जो की निचे लिस्ट की गयी है.